The first and last photo of this Climate Chronicles entry are literally the first and last photo I took during the Climate Camp week, July 25-29. It is a strange mystery, these two shoes, the kind of thing that makes you smile and think, well, think that anything is possible, just in case you, like me, sometimes get the feeling that our problems are too complicated to solve. It's good to be reminded there is magic afoot, so to speak. But before I dig in on this year's weeklong camp, I have to shout out to the people who make it possible from a financial standpoint. My work at Earth Charter Indiana is largely about our youth program, Youth Power Indiana, and I couldn't do this work without the assistance of the following: The Netherleigh Foundation, The McKinney Family Foundation and our newest funder, The Herbert Simon Family Foundation. 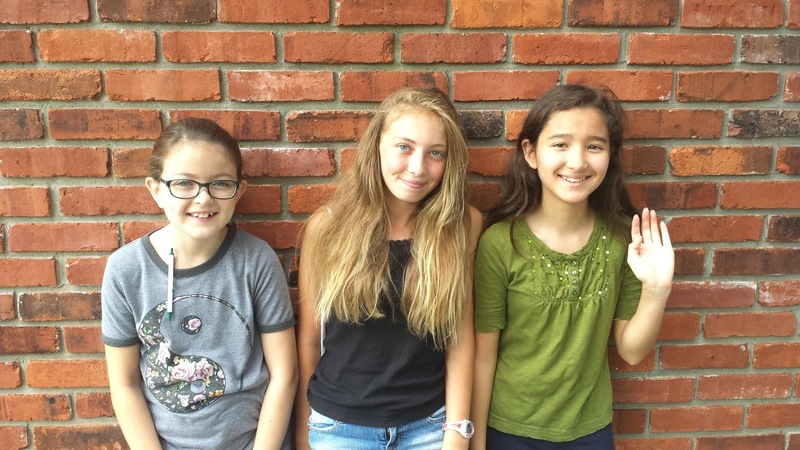 All three help ECI by giving funds to help our youth program grow, a growth exemplified by our Climate Camps. Add to this list Lilly Endowment Inc. whose support is specifically for our camps, as part of the Summer Youth Program Fund. A thousand thank-yous. 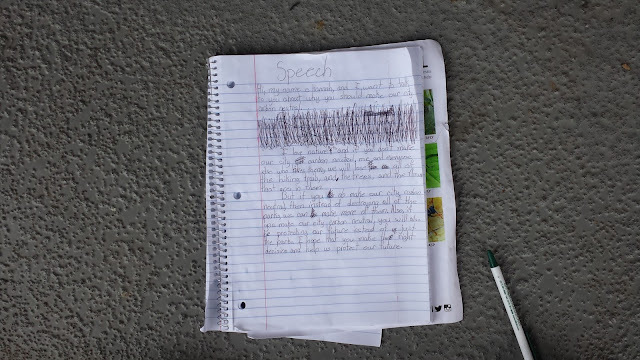 I happen to think this is the most important work I can think of, getting kids in leadership positions to deal with climate change and all the concomitant issues that connect to it: poverty, racism, and a beleaguered civic engagement spirit. Our main partners on this annual weeklong camp include the Peace Learning Center, where two of our days were spent this year. The other partner is HEART (Humane Education Advocates Reaching Teachers), whose philosophy and pedagogy infuse our Climate Camp curriculum. 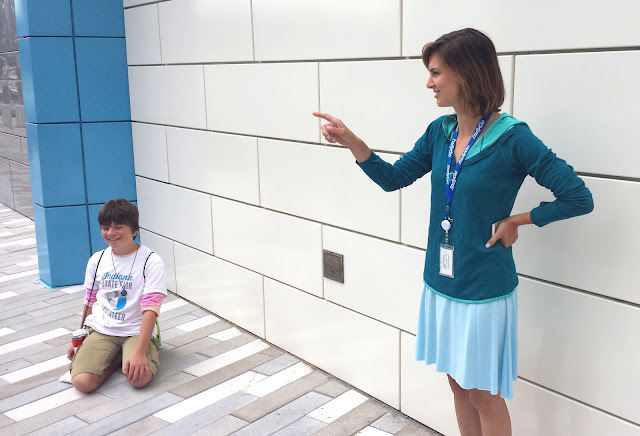 PLC and HEART intersect at one essential person for our camps, Kristina Hulvershorn, Youth Program Director at the PLC, and also involved with HEART. Kristina is really the heart of Climate Camp, and she is also the brain, since she has loads more experience than me on how to corral lots of kids into a productive and meaningful camp experience. 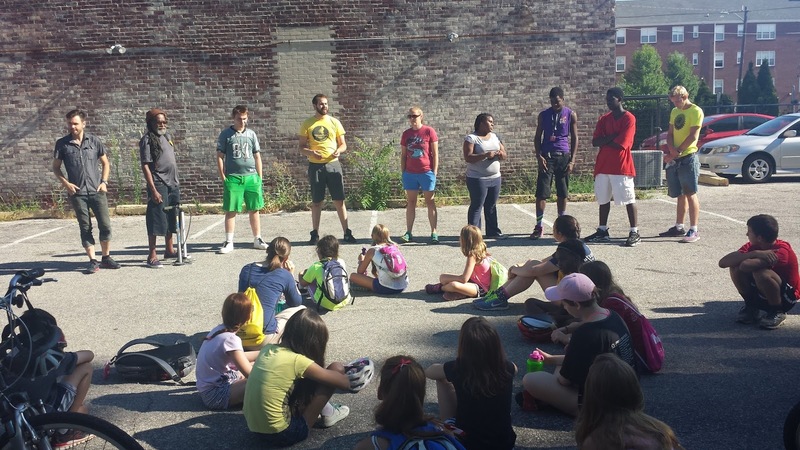 Thanks to everyone who made — and makes — this camp possible, a camp that began in the summer of 2014 and continues with day camps and weeklong camps. Big hugs to Megan Hart, who volunteered every single day of the camp, and to Brian Plankis, our science advisor, who spent many hours with us. If you are interested in getting involved, contact me via this blog or my email. Our first day was set at the Peace Learning Center at Eagle Creek. And boy did we pack it in, with numerous presentations and other activities that we hoped would set the stage for the rest of the week. During Climate Camp, we carpool as much as possible, to keep the carbon footprint down while increasing camaraderie. I myself often had 3 or 4 campers in my car. The very first action on the morning of day one was to pick up my first camper, a counselor named Noah. I went to the house where he was staying (he lives in Lafayette), and was greeted by the image, below. The mystery begins. As I pick up Noah, all I see is this shoe. Spontaneous (almost complete) combustion? Noah soon emerged from the house, in his socks, to tell me he'd lost his other shoe, speculating that perhaps one of the dogs had carried it away somewhere. He returned to the house and came back with a different pair of shoes. I took this above photo because ... well, because it was the very first symbol of this week's Climate Camp. I didn't know what it meant, nor did I know what it might mean. I just felt the compulsion to secure the image. 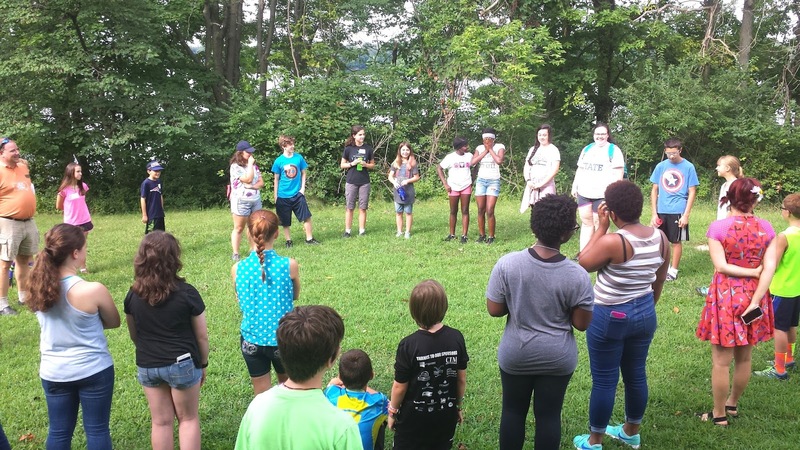 The first order of the day — after the shoe mystery was begun, and the ice breaker was staged — was to divide our three dozen campers into smaller groups; in other words, to form Tribes. I'll let Kristina explain: ""one of the key ways that we make climate camp work is to create a real sense of community through youth-led tribes. The students arrange themselves according to strengths and interests in small groups called tribes. Students name their tribes and look out for one another helping to fast-track inclusion and community building. It doesn't hurt that it's a super fast way to take attendance, or in our case, make sure we haven't lost any campers!" Our first game of the day at the PLC helps break the ice as campers share unique details and talents. 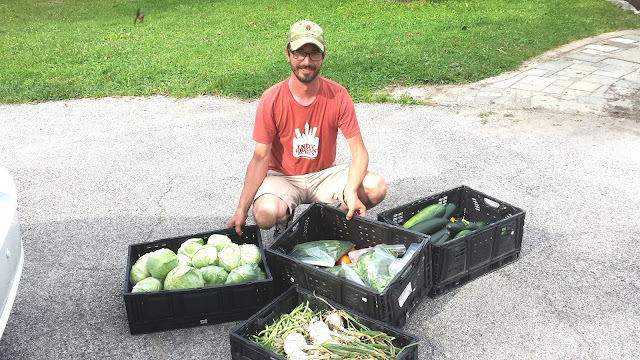 Thanks to Tyler Gough at Indy Urban Acres for donating so much tasty produce for our vegan lunches. This week was also, coincidentally, ALEC's national convention, so it seemed wise to let campers know it was happening, in case they wanted to attend a protest (see Day 3). 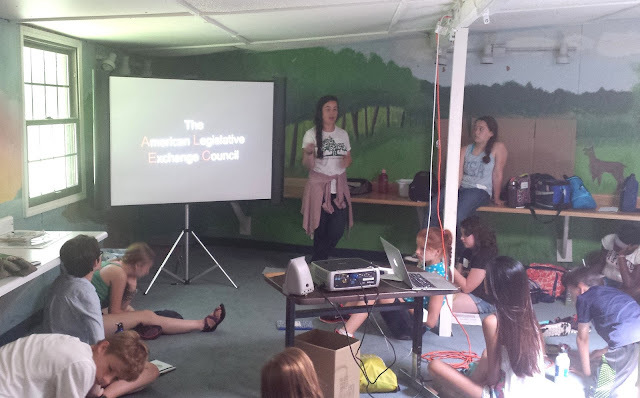 Here, Delia, head of our press corps at Climate Camp, delivers a presentation on ALEC, specifically their emphasis on supporting fossil fuels while discouraging renewable energy. One of our assistant directors, Tessa, standing, delivered a presentation wrapping up what kids are doing throughout the country regarding fighting climate change — and fighting adults' lack of action about it. Climate Camp broke into four tribes to facilitate discussion as well as formulating projects for our showcase (see Day 5). To explain more about our food philosophy at Climate Camp, once again, I'll bring Kristina into the conversation: "A core component of climate camp is for students to practice sustainable choices in every facet of daily life. This 'be the change' philosophy can be seen when campers wash dishes instead of using disposables, print shirts on previously used shirts, bring until their own water bottles, and eat local, vegan and organic food. "Our food, prepared by a veteran camper (Sam Piper, see below), did not have to travel as far to make it to our mouths so less CO2 to was used for transport, plus the lack of pesticides created a more hospitable environment for pollinators, the ecosystem as a whole, and the farmers who grew it." 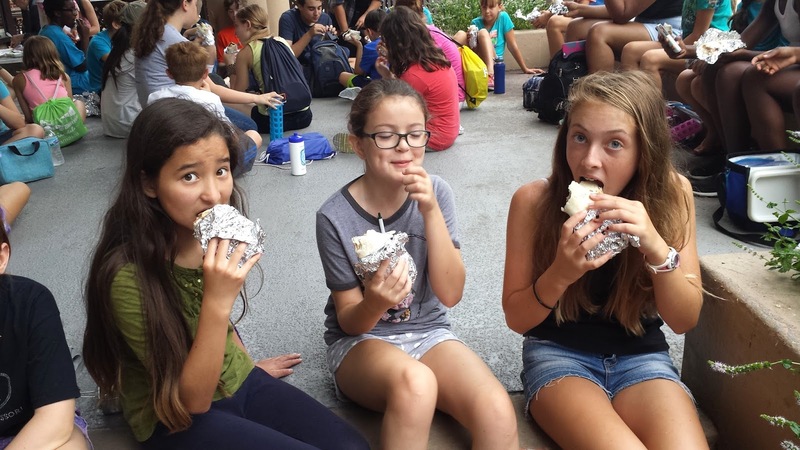 Kristina adds, "Lastly, the food we ate was vegan because plant-based foods create far less of an environmental impact in terms of land-use, CO2 and methane output, water use, water pollution, among other benefits to animals, global hunger, and health!" This year we decided to do a Walking Tour of downtown Indy, emphasizing sustainability and adventure. It was an ambitious day and frankly, it was a relief after the presentation-heavy Monday. 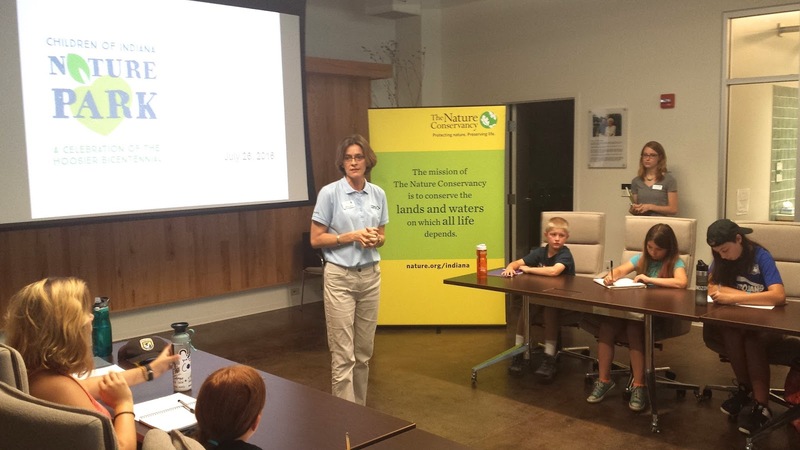 We started off at a favorite destination, The Nature Conservancy, but instead of the regular, inspiring tour of this green building, we wanted to learn about the TNC's new project, the Children of Indiana Nature Park. This new park, located on 31 acres in Centerville, Indiana (near Richmond), literally deeds a small portion of land to Indiana's children. We were surprised after the presentation with actual deeds with GPS coordinates, so campers can visit their plot of land any time they want — either on line or in person. 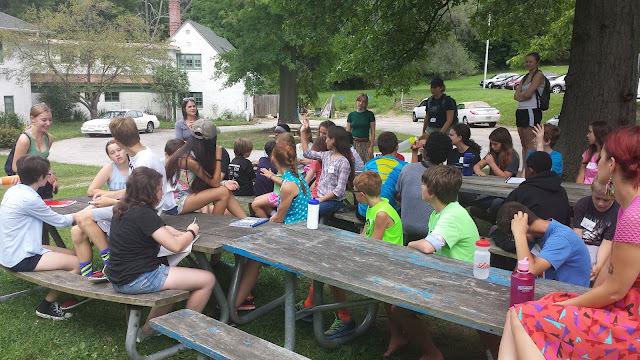 TNC's Melissa Moran tells our campers all about the Nature Park and how they can take ownership of it. 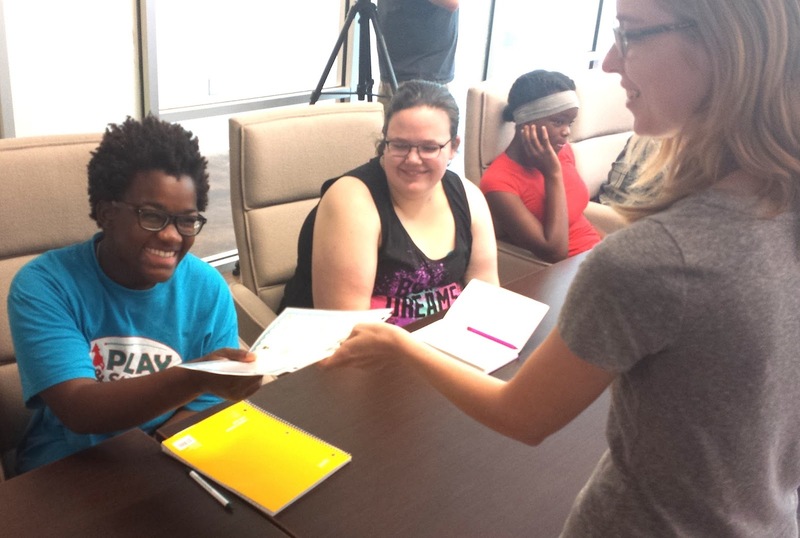 Rachel, left, receives her deed from TNC's Laura Sertic. 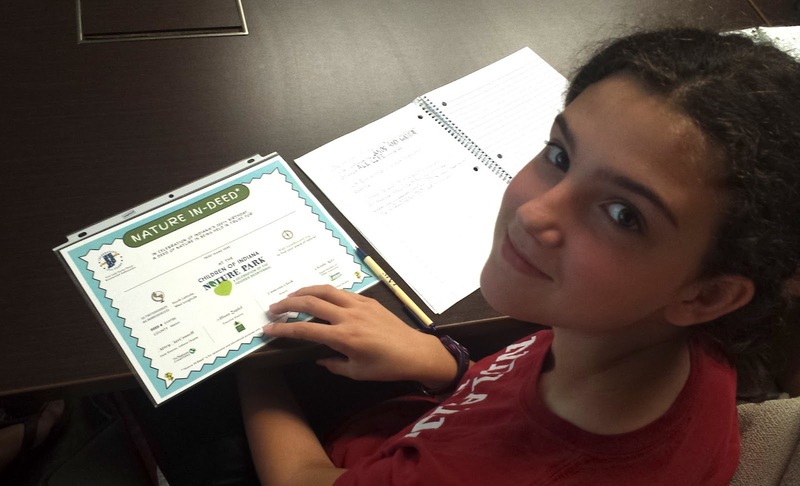 Emily is excited about her new deed. Teddy and other campers learn all about The Nature Conservancy's geothermal system. 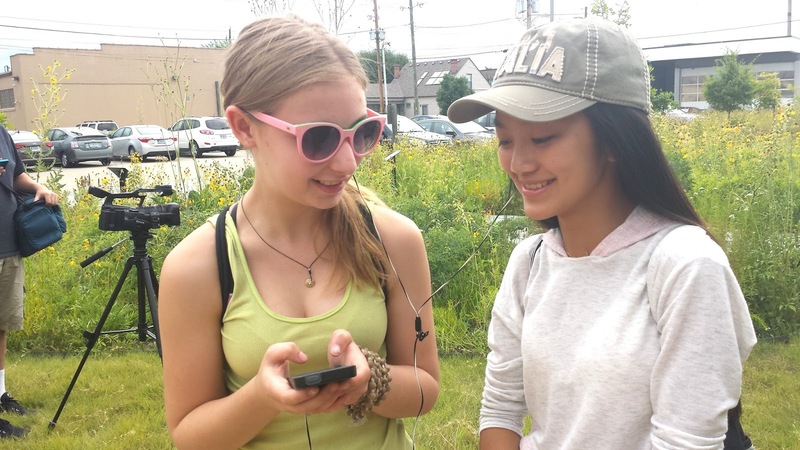 Hannah, Isabelle and Himiko take a break after touring The Nature Center. Lucy, left (our portrait artist, see below), and Vanessa, share a tune at The Nature Conservancy. 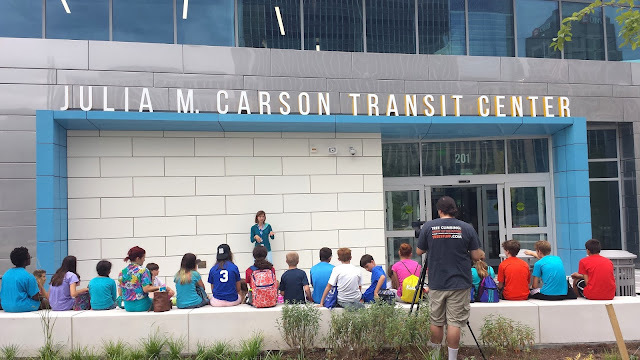 Next stop on our walking tour, IndyGo's new transit center. 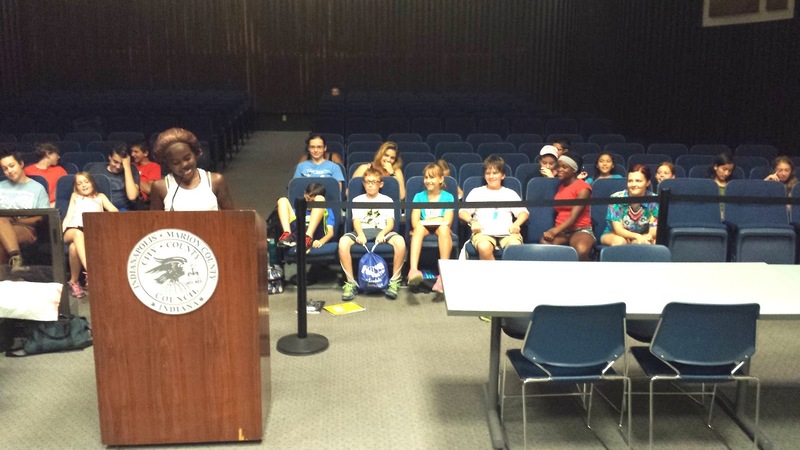 IndyGo's Lauren Day took time out of her busy schedule to meet with our campers. 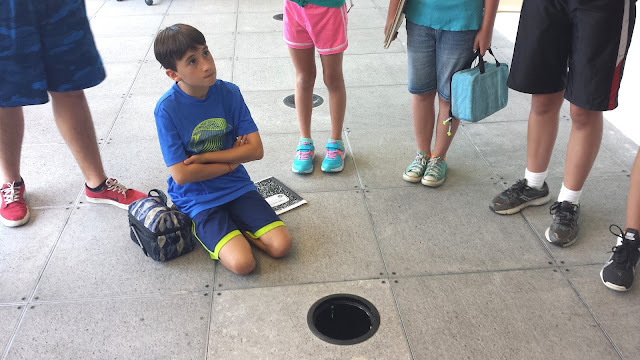 Campers learn all about the sustainability measures of the new transit center. 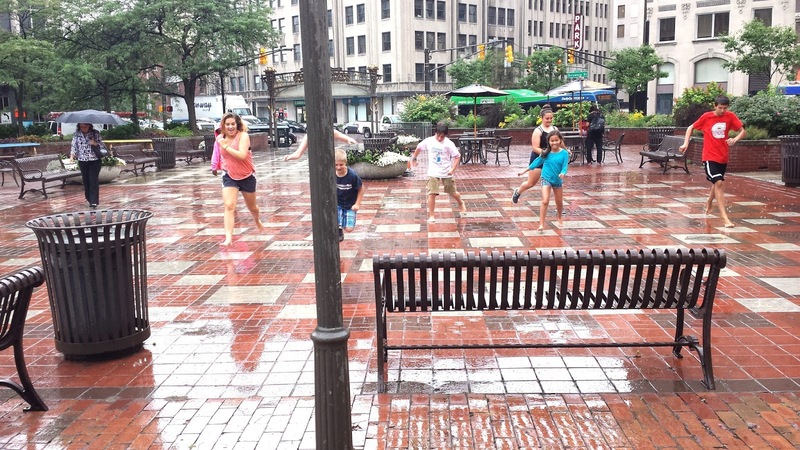 You can't plan this: It rained, and climate campers turned it into a game. 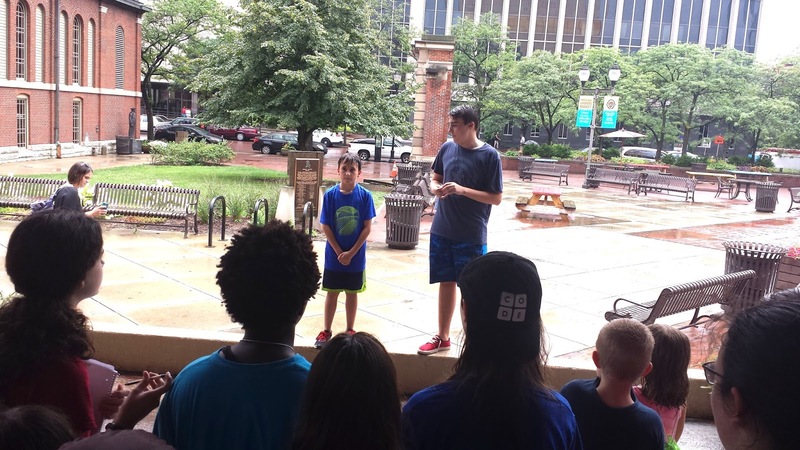 Part of our lunchtime stop at the City Market was a workshop on public speaking, courtesy of two campers well versed in being before the public: Teddy (Tiny Tim in IRT's 'The Christmas Carol') and Ben ('Shrek, The Musical'). 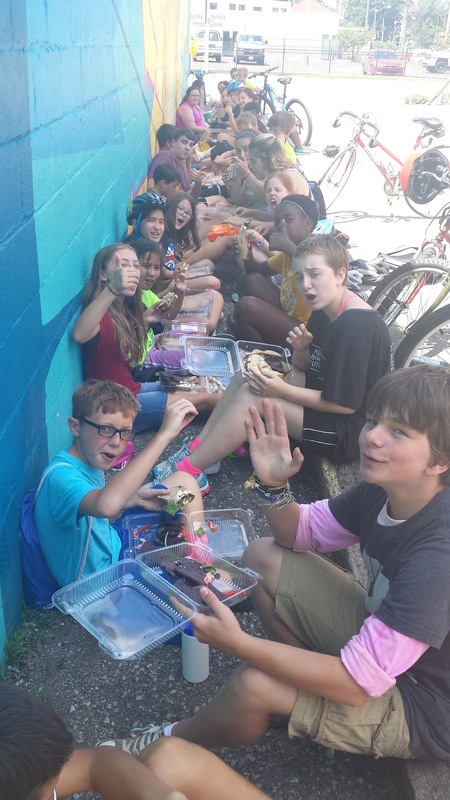 Lunch on Wednesday was vegan burritos comprised of ingredients from Indy Urban Acres and Pogue's Run Grocer, prepared by our Climate Camp chef, Sam Piper. 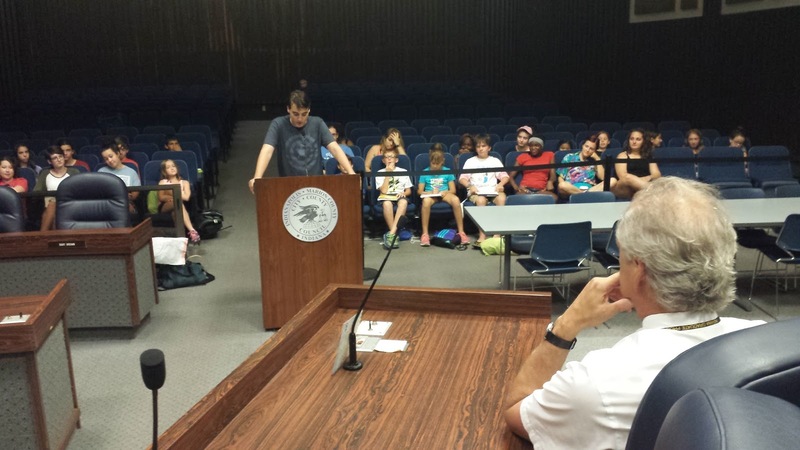 By the end of lunch, most campers had prepared their testimonies to the City County Council. 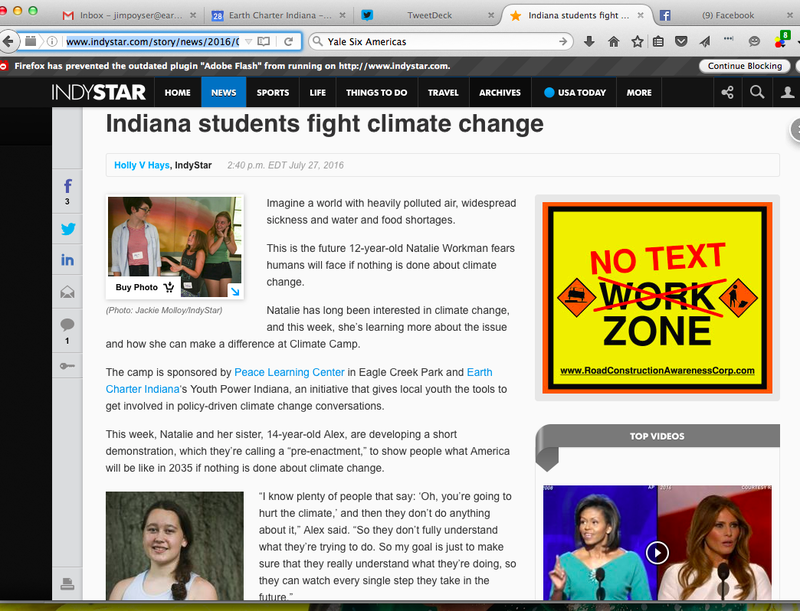 A centerpiece of our day — and our entire week — was the work we're doing in Indianapolis to promote climate recovery. 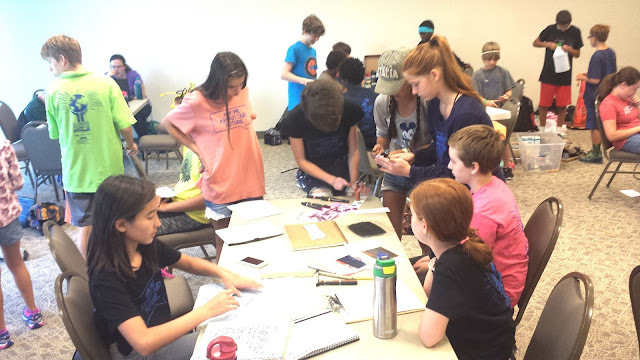 The basic idea is youth work to understand not just the science of climate change and how we can solve it, but also civic action needed to push change through. (See my blog on Shortridge High School.) Note that this is happening elsewhere in the country, thanks to iMatter and Our Children's Trust. Youth are advocating for Climate Recovery resolutions and ordinances in numerous states in this country, which is a pretty cool way to get adults to get out of their day-to-day bottom line thinking to focus on making longer-term decisions that ensure these kids will even have a future to grow up into. We've been working on Climate Recovery here in Indy, from meeting with City Council members to meeting with members of DPW and the Office of Sustainability. Learn more about Climate Recovery here. So our plan was to take our camp to the public chamber of the City County Council, so campers could get comfortable with the process of advocating for change. The City County Council public room was secured by a couple of City Councilors, Jared Evans and Zach Adamson, who are helping our campers prepare for this work. We were fortunate that Judge David Dreyer stopped by to add his voice — and ears — to our afternoon. 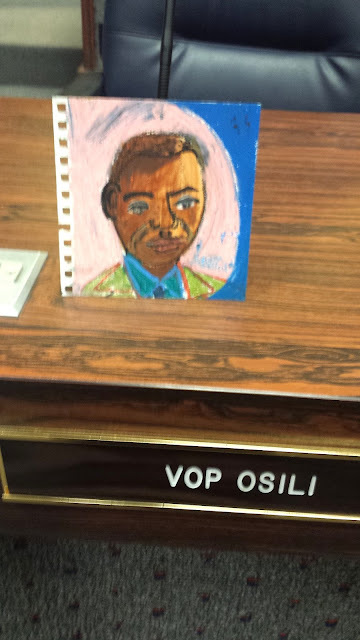 In other cities, including our partner city, Carmel and their Promise Project, youth place color photographs of the City Councilors on the chairs so that kids have something to look at besides an empty chair. It gives them a sense of reality, having an image there. 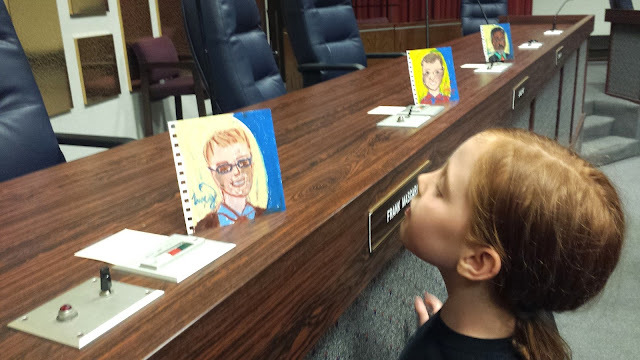 In our case we are lucky to have a veteran camper named Lucy, 13 years old, who is a prolific, and highly talented, portrait painter. She agreed to do portraits of each of our 25 City County Councilors. Ella checks out Lucy's portraits, in preparation for delivering her testimony. 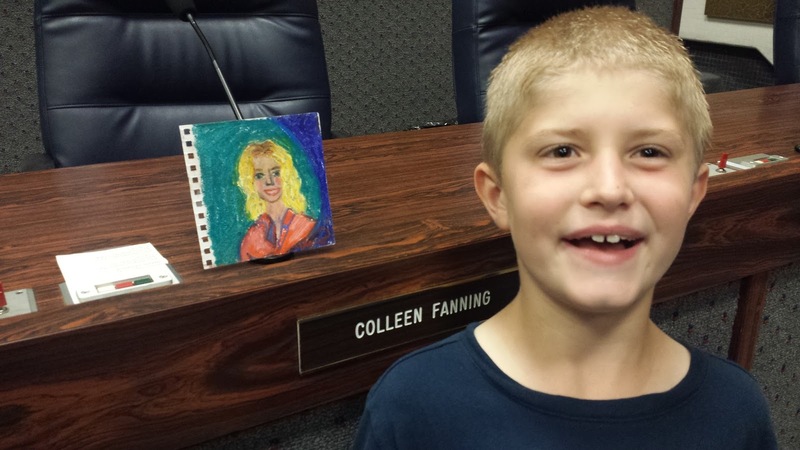 Carter checks out Lucy's portrait of Colleen Fanning. Fifteen year old Ben gives his speech. In the foreground is Judge David Dreyer, who was kind enough to spend time with us in the chamber, giving feedback to the campers as they testified. Lilith takes her turn at the mic. Only 11 years old, Ocean is nevertheless a Climate Camp veteran. Here she testifies about the need for carbon neutrality, emphasizing the science of climate change. and maybe share a ghost story or two. 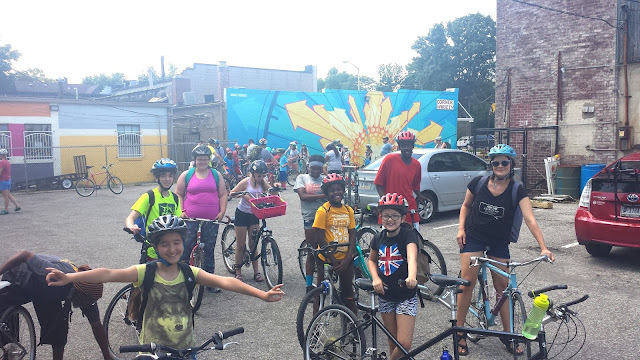 We love riding bikes because it reduces carbon footprint while increasing self-reliance and physical health. So day 3 was about partnering with one of our favorite partners: Freewheelin' Community Bikes. They are basically in the same business we are: building and empowering youth leaders. They've been doing a long time, thus we always are learning from them. In past years we foolishly had everyone on a bike ride in one group. Too chaotic. This year, we decided to divide up the 4 dozen bikers and adult volunteers into four groups, so we would have less chance to run into each other on the trails. It wasn't perfect, but it was an improvement. Freewheelin' youth leaders begin the morning activities, instructing on bicycle maintenance and safety, along with tune-ups to make sure the bikes are ready to roll. 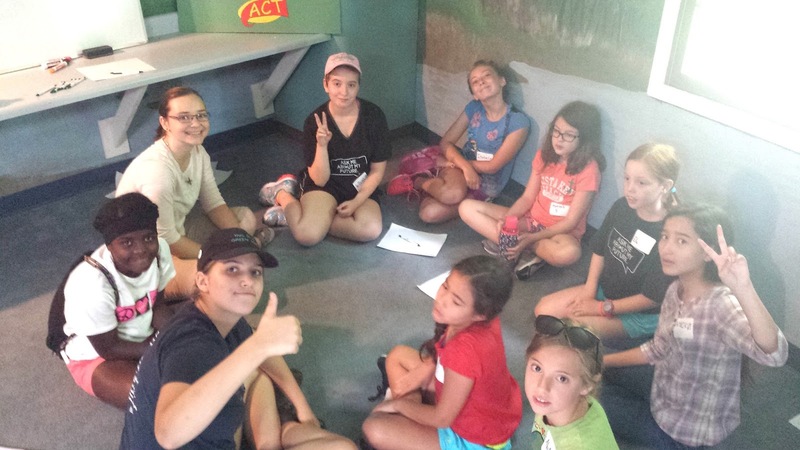 Campers thank Three Carrots for providing us a delicious vegan lunch! Here we are at the beginning of our ride we dubbed Tour de Hives, as the plan was to visit numerous beehives. That's camp co-director Kristina on the right. The famous Noah of the shoe saga is on the left in the green shirt. 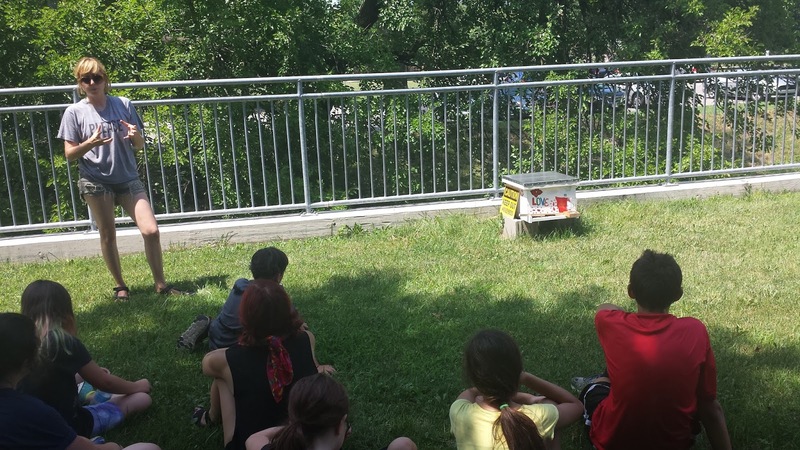 Kate Franzman, left, talked to Climate camp bicyclers about the hive she placed at Harshman Middle School, part of a partnership with ECI called Save the Bees, funded by SustainIndy. 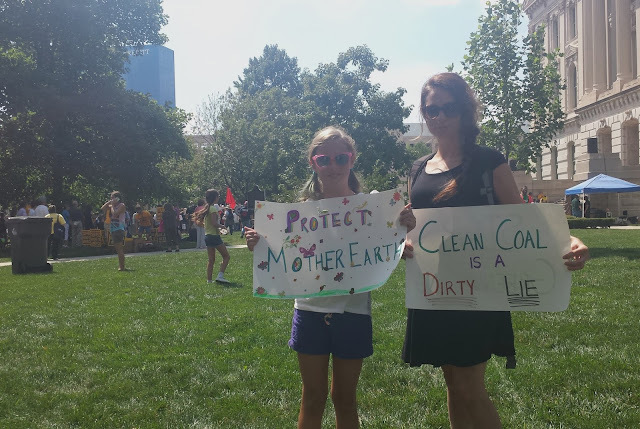 Like mother like daughter: Abigail and Trisha ended their Climate Camp day at the Statehouse protest that focused on the role of ALEC in crafting legislation throughout the country. 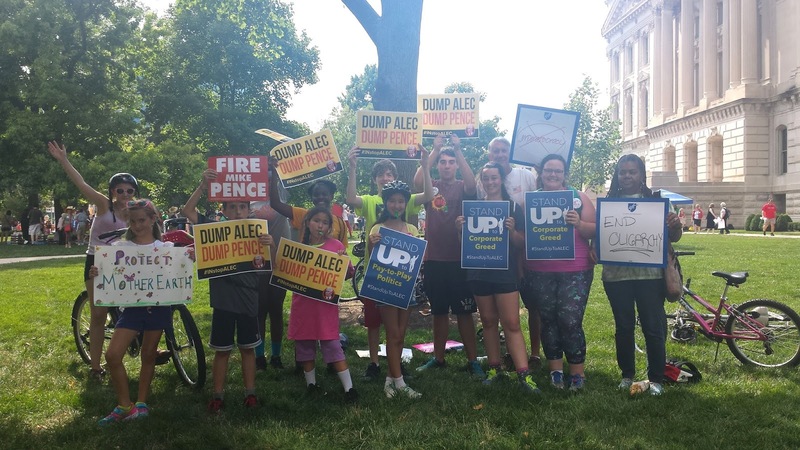 Part of our Climate Camp ended up at the ALEC protest at the Statehouse. 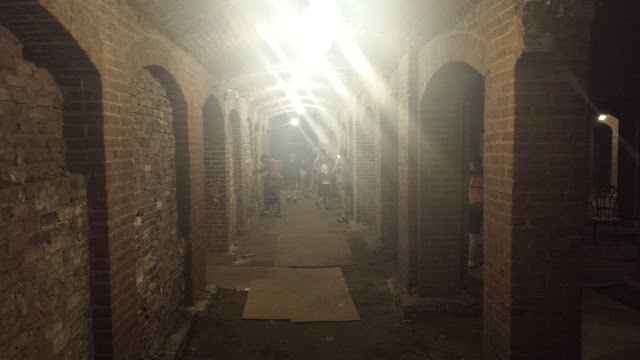 It was optional for parents and campers who were interested. The other option was to return to Freewheelin' Community Bikes. We felt it was important for our campers to understand that part of advocating for their future is about getting out there and having their voice heard. When it comes to ALEC, it is especially important, as ALEC is not helping when it comes to moving us toward a green energy future. 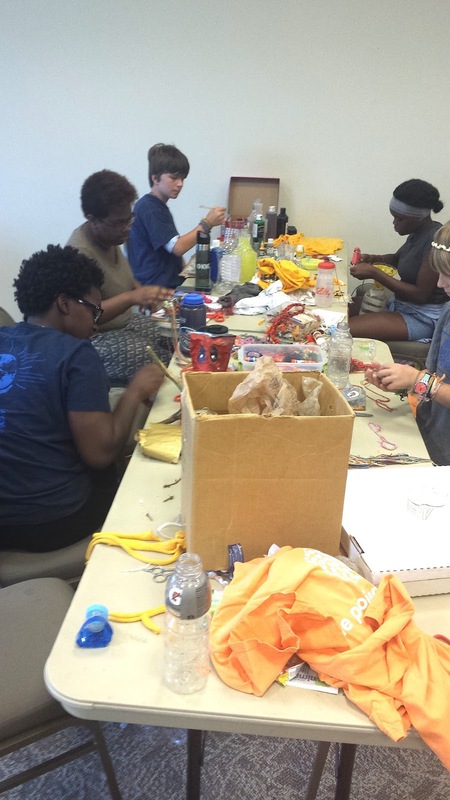 Our fourth day of camp was designed to be a day-long work session, preparing for our showcase the next day. But we all felt we hadn't paid enough attention to the issue of environment racism. Led by Butler University Senior Tabitha Barbour, an assistant director at Climate Camp, we met at the PLC for an hour, discussing the intersection of poverty, racism, and the climate crisis. 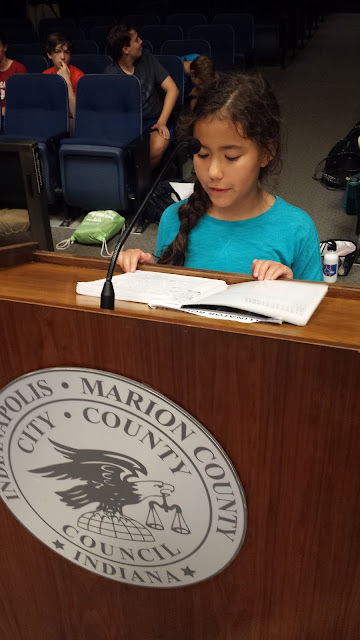 One of the campers, 11 year old Ocean, compared aspects of environmental racism to "segregation and discrimination, because some people think they are superior to the earth to different people on it, but really we are all equal." Another camper, Aidan, said, "all the injustices are connected." Day 4, though, was also about getting media attention, which has not been easy. Quite often I am the media attention, in the form of this blog which has limited reach. 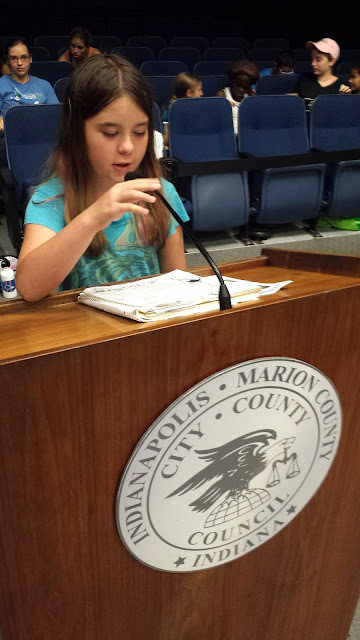 We were lucky this week, because the Indianapolis Star came out to the PLC Monday to visit us and the result was this great story. We were also treated to a visit to WFYI to livestream an interview which you can find here. Beautifully written — and photographed — story in the Indianapolis Star greeted us online on Thursday morning. The story appeared in print on Friday. 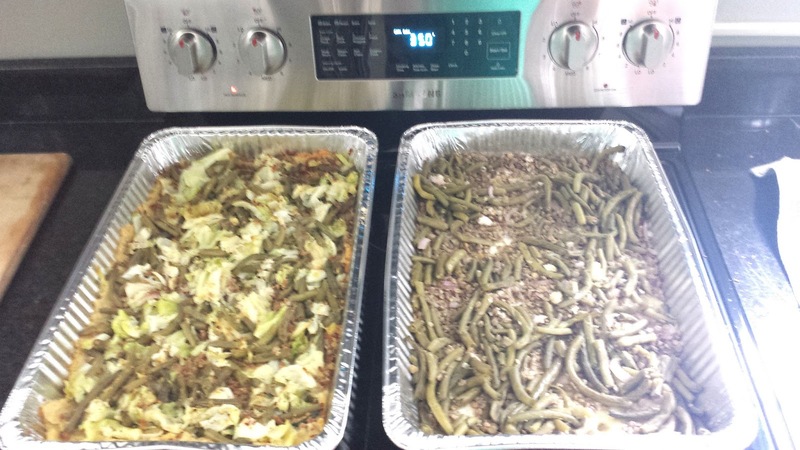 Just in case you are wondering what we ate, this was Thursday's lunch, shepherd's pie, vegan-style, made from ingredients donated from Pogue's Run Grocer and Indy Urban Acres. Chef Sam Piper did a fabulous job! 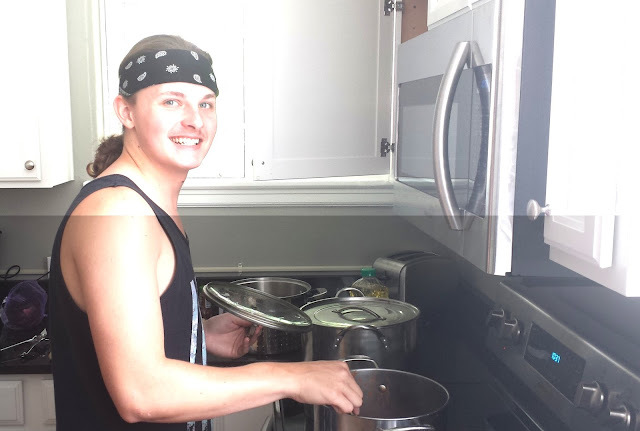 Veteran Climate Camper Sam Piper has found his passion — and potential career path — in cooking for camp. 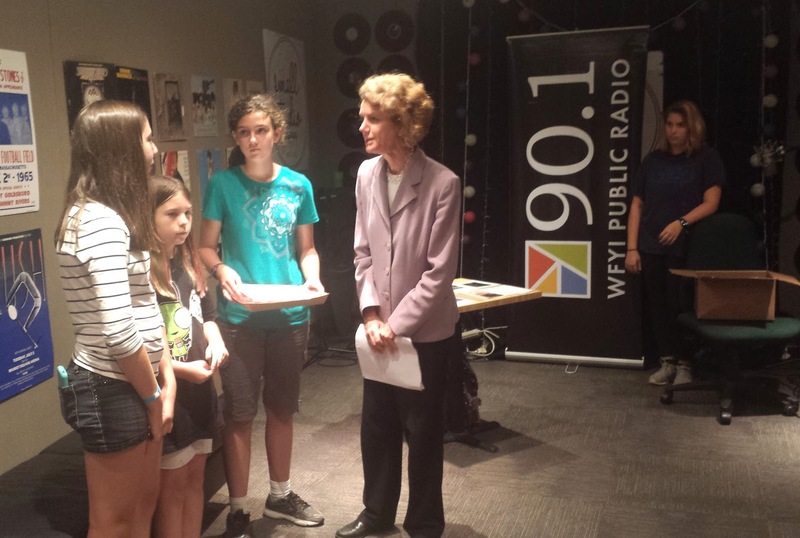 After camp ended, I took the #JustTrayNo kids to the WFYI studio to record a live stream event, promoting our next day event, Speak Out For the Planet. Jill Ditmire (center) has been such a great supporter of our climate work. She invited us to participate in this filming. #JustTrayNo kids are to the left and Ella (hidden) just finished her conversation. To the right is Cora, who, as a Climate Camp veteran, gave a lovely overview of the week. 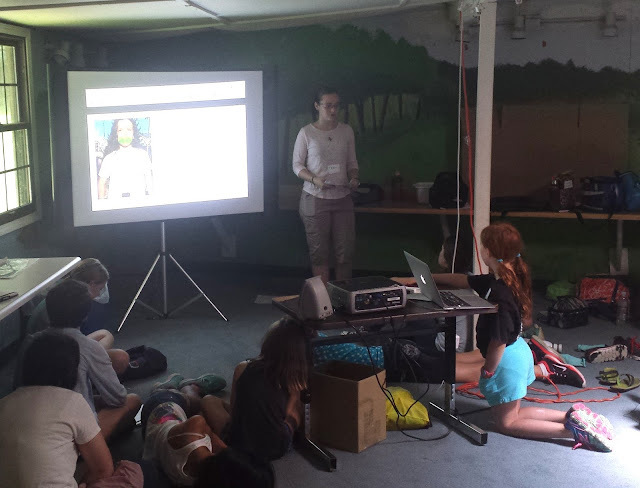 The culmination of our Climate Camps always involves a showcase of presentations. Yeah, I know what you are thinking; cute, sweet, maybe a little unbearable. Remember, though, these kids are trying to save their own futures, so while it may seem like kid stuff on the surface, but really it's dead serious. While... being pretty cute most of the time. 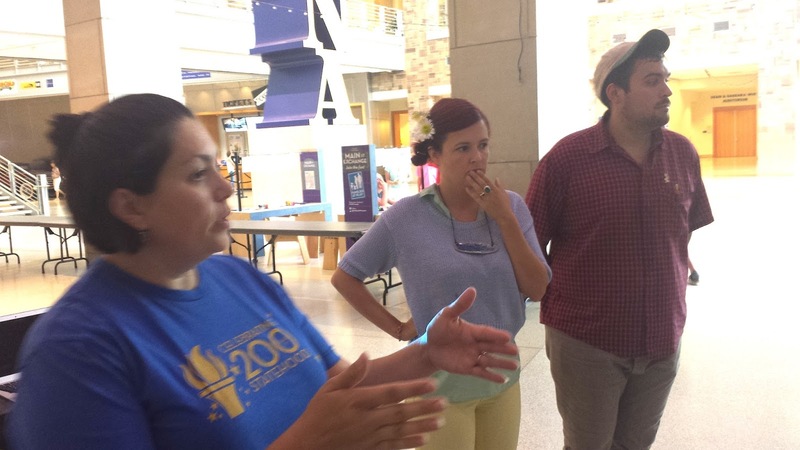 We were so fortunate to get the a-okay from the Indiana State Museum to use their space for both prep and performance. ISM and ECI are already involved in the annual Eco Science Fair. This takes our relationship to the next level as far as I'm concerned. Thanks to Joanna Hahn, my Eco Science Fair partner, and all the fine people at ISM. You are truly in service to our youth. We were fortunate to secure a conference work space at the Indiana State Museum so campers could prepare for their showcase, Speak Out For the Planet (SO4P). Campers created over a dozen tables to instruct on climate change, recycling, carbon footprint, and other actions dedicated to securing a safer future for themselves. Another table prepping for SO4P. Thanks to Joanna Hahn of the Indiana State Museum, we were able to utilize the beautiful East Wing of the Great Hall of the ISM. Helping out that week was Megan Hart (center), and on that Friday, Brandon Schaaf. You might know Megan and Brandon from the playful and beguiling theater troupe, Know No Stranger. Most of the group, outside the ISM, before our rehearsal. 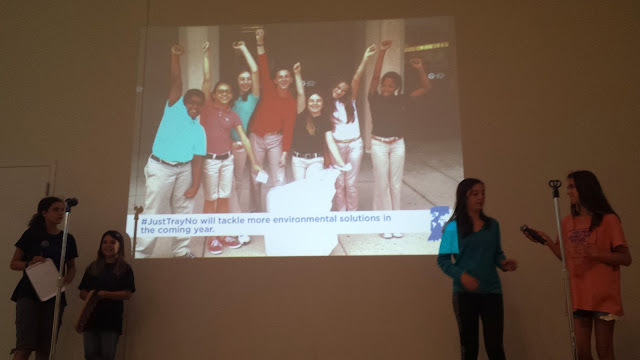 #JustTrayNo, one of the stars of Climate Camp due to their success this year, presented to the audience at the ISM. 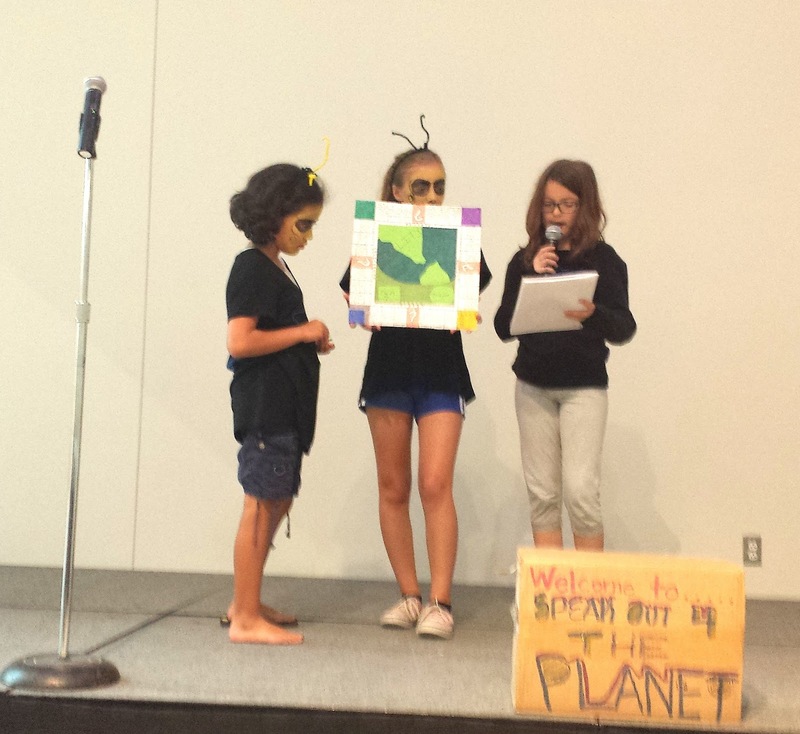 Hikari, Isabelle (dressed for a play about Colony Collapse Disorder) and Hannah created a board game called Reality, modeled loosely on Monopoly, except their game is about human impact and how to restore our eco-system by actions such as planting trees. 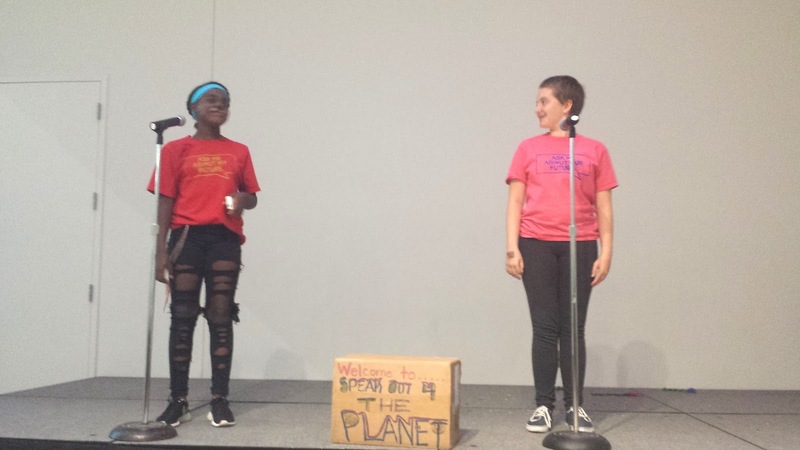 Ocean, left, and Hillary, blew everyone away with their beautiful spoken word piece, "99 Reasons to Save the Earth," a fitting finale to our showcase. So now we come to the magic moment, and I hope you enjoyed your journey along the way to get here, because honestly, as I post and review these photos I'm boggled by the experiences and fun we had. Who needs the Strange Saga of the Shoes to reveal this to be the juggernaut of fun it turned out to be? Well, you do. So here it is. Remember that first photo? Noah's shoe on the porch, the one I knew somehow would be meaningful? 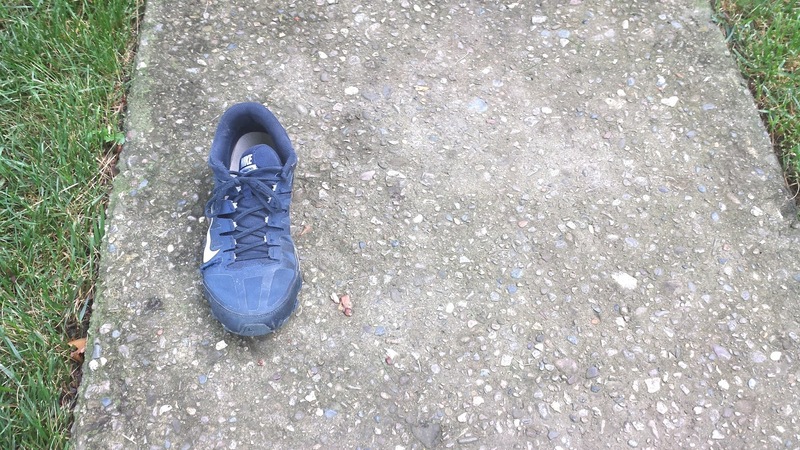 At the very end of the showcase — when we were cleaning up — one of my campers came up to me with the shoe, below, in hand, telling me that Noah had left it behind on his way to California. 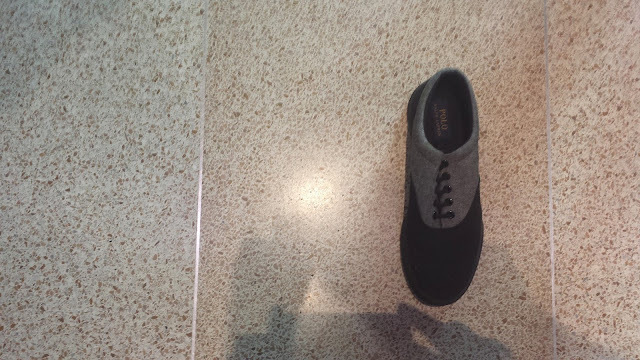 The first shoe was a right-footed shoe; this one, a left-footed shoe. Earlier that day, Noah had left to visit his grandparents in California, so we can only imagine this poor kid is shy on shoes, or, perhaps, has a mismatched pair. What an amazing story of a jam-packed week filled with learning, passion, creativity, fun, talent, friendship, leadership, hope and anticipation for the future! Thank you Jim, Kristina and your intern assistants. Thank you to the parents of the campers for allowing them to participate. And thank you to the campers for your enthusiastic participation. We are in good hands! Wow! What fun. What an impact. 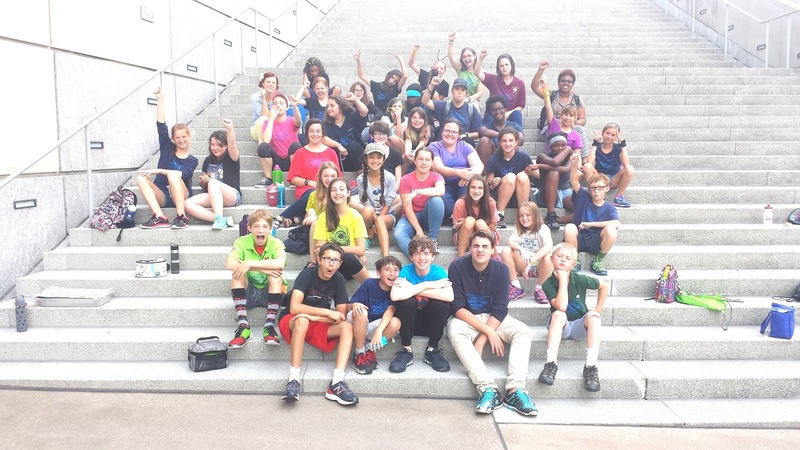 Great intersection of committed adults and creative kids for a cause that really matters. At this page you will find numerous writing tips and helpful articles for all the writers and bloggers.